Jane Yellowrock and her new boyfriend, Rick, are enjoying a brief respite from supernatural mayhem, staying at Jane’s residence in the Appalachians as they pack her belongings for a more long-term stay in New Orleans. Their peace is disrupted by an early morning news report that reveals the existence of werecats. As the story travels around the world, werewolves come out of the closet too, and one alpha werewolf appears on national television to accuse Jane’s boss, Leo Pellissier, of a long-ago murder. Naturally, this means Jane is called back to New Orleans to help Leo with damage control. Rick’s work is back in full swing, too. He’s on an undercover mission that keeps him from communicating with Jane much at all during the book. There are a ton of things going on here. At times I was confused by all the plotlines that were hitting the fan. It’s not just that I couldn’t guess the answers — I wasn’t quite sure what the most relevant questions were. Who really did commit the murders? Who and what is Girrard DiMercy, the enigmatic stranger who rescues Jane from a werewolf attack, and what is his agenda? How do the African werecats fit into all this? What’s Rick doing? Is Rick cheating on Jane, and if so, should she give Bruiser another chance? Why is Evangelina acting strangely? What is the grindylow doing? How did werecreatures originate? Why is Katie out of her healing stasis prematurely? What happened a hundred years ago in vampire politics that helped trigger the current events? Truth be told, there’s always been an element of confusion in the Jane Yellowrock novels. Faith Hunter creates huge tangles of plot ideas and it’s sometimes easy to get lost in them. Some of this is because they’re mysteries, which presuppose a degree of obfuscation, but even as mysteries go, these books are complicated. Some readers will enjoy this intricacy more than others. In my opinion, the confusion was easier to stomach in Skinwalker and Blood Cross because Hunter was introducing Jane’s world and history in those two books. In Mercy Blade, with much of the background already built, the confusion is more frustrating. Several of the confusing aspects become clearer at the end, and are wrapped up in satisfying and clever ways. Others seem convoluted even after they’re explained, though, and a few feel like pieces from the wrong puzzle, even after the book’s end. 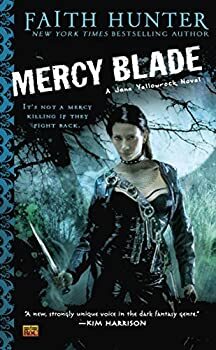 If you’ve enjoyed the Jane Yellowrock books previously, there is still a lot to like in Mercy Blade. There’s plenty of motorcycle-riding, gun-toting action; a richly detailed New Orleans atmosphere; a healthy dollop of sexual tension; a beautiful scene of mysticism; and a few (though fewer than before) chapters told from Beast’s point of view. Especially amusing is Beast’s reaction to Jane shifting into a dog for part of her investigation. The lycanthropes’ history is also fascinating. I’m a little disappointed in Mercy Blade overall, however. The behavior of certain recurring characters plays a role, as they become less sympathetic (though it’s to Hunter’s credit that she makes me care enough about these characters to get mad at them when they behave badly). The confusion, though, is the biggest problem. I can deal with confusion in the first book of a series. It’s more annoying in the third.